The strawberries came, and they’ve almost gone. While most popular strawberry varieties are called “June bearing,” most of our crop matured in May. There are still a few stragglers here and there, but it looks like we’re done with the big juicy strawberries. That’s okay, because I’ve developed a taste for smaller berries… but at least one of our plants has a tendency to produce strawberries that are more tart than sweet. They’re still pretty tasty, but since I can’t remember which plant it is that does that, or which berries, every time I bite into a tiny berry I have to wonder if it’s going to be sweet or tart. While the strawberry plants are winding down their berry season and sending up new leaves and runners to make it through the next year, other plants in the garden are starting to come in nicely. The garlic I planted last fall has grown big and strong. It should be time to start pulling up the roots soon. For now, I get to enjoy a treat I only first learned about when I started doing my grocery shopping at farmer’s markets a few years ago — garlic scapes. 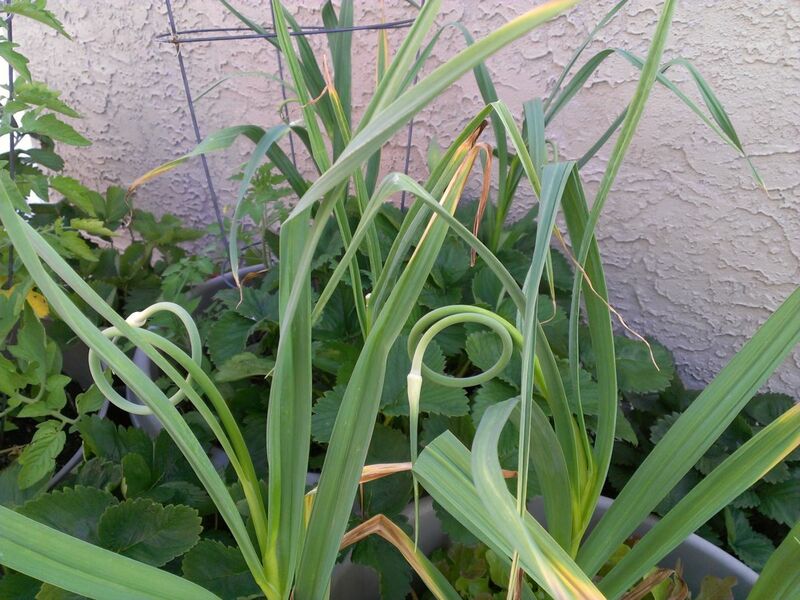 A month or two before garlic is ready to harvest, some plants send up green shoots that curl into a spring-like shape. If you leave them too long they’ll start to flower and take energy away from the root/bulb, which is where what we think of as “garlic” comes from. 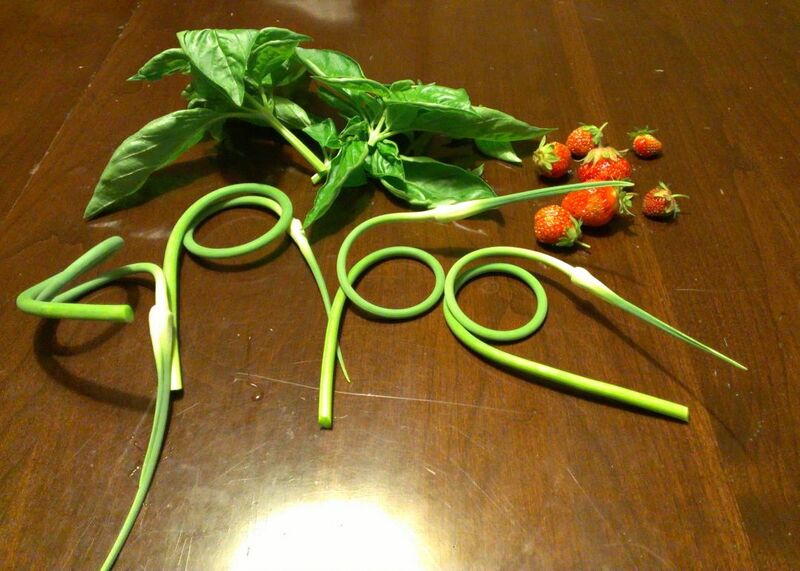 So it’s best to cut the scapes off before they flower. They also happen to be super-tasty. You can chop them up and cook them like a spring onion, or even eat them raw. They have a garlicky flavor, but they’re not nearly a strong as the garlic you buy in stores. 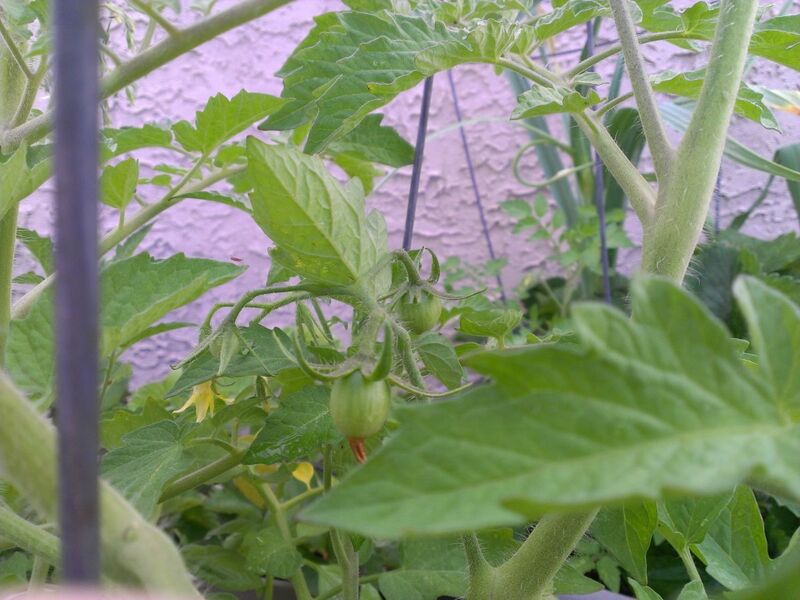 Last, but not least, the cherry tomatoes I planted this year are growing like crazy. 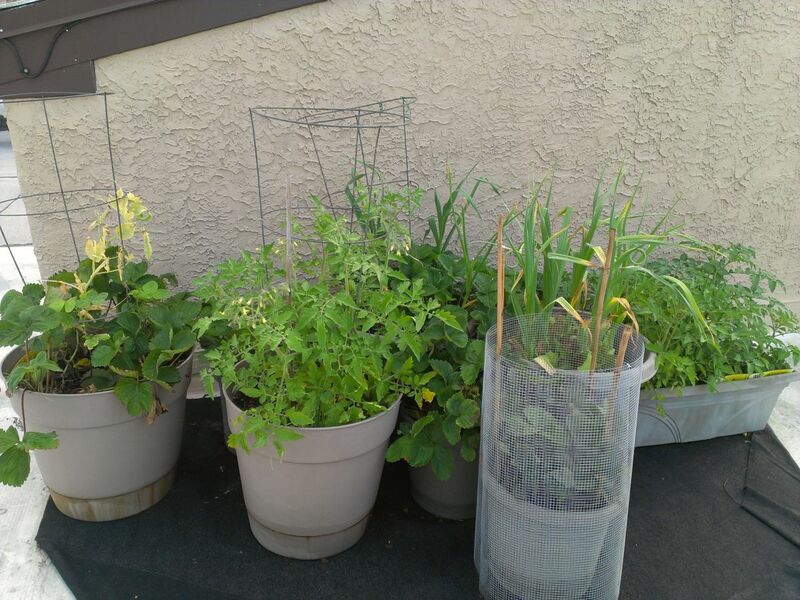 While I’ve pretty much given up growing some things in my container garden, because they don’t seem to like the climate on my rooftop (I’m looking at you, bell peppers), cherry tomatoes might be up there with snow peas under the category of things that grow spectacularly well. In fact, I have a number of unplanned tomato plants this year. I’ve been experimenting with using two planters as sort of open-air compost bins, where I can throw some food waste and plants and weeds I pull up (partly just so I don’t have to lug it down three flights of stairs). It turns out some of last year’s waste has popped up in the compost pile as cherry tomato plants. The soil isn’t very deep in those planters, and there are no cages, so I transplanted a few of the plans and gave one away to a friend. I’m leaving a few more to grow just as an experiment. 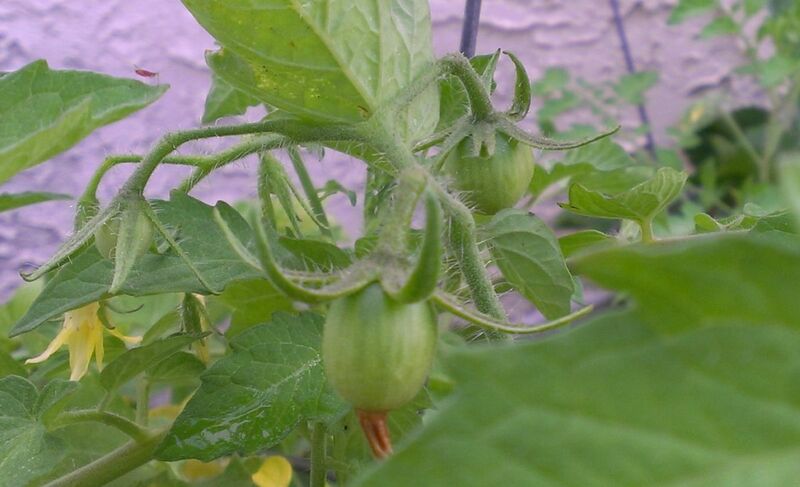 In the bigger, deeper pots, where I did intentionally plant some tomatoes this year, there are a ton of tiny flowers, and this week the first little green tomatoes started to show up. Hopefully they’ll be yellow and in my stomach soon. (Yellow and orange tomatoes have less acid than red tomatoes, and I’ve found I have an easier time digesting them, so that’s what I grow). Another fun fact: I haven’t planted a single basil plant this year, but I’ve had a little more than half a dozen plants pop up in the compost pile and in a few other planters. I’m not complaining.